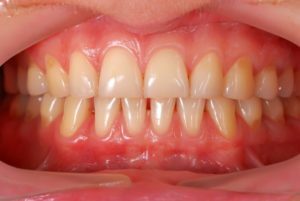 Your Dentist Says You Should Never Ignore Receding Gums! Do you notice your teeth becoming longer than usual? Do they feel tender to the touch or make eating foods difficult? Perhaps you notice sensitivity when drinking hot or cold beverages? According to your dentist, these signs point to issues that puts your teeth and roots at risk if left untreated. This is the issue of receding gums. Having a healthy smile is one thing, but healthy gums are absolutely crucial to holding your teeth in place. It’s important to note that receding gums is a common side effect of aging. However, that doesn’t mean you should simply ignore it when the symptoms appear. When the gums begin pulling away from teeth, it exposes tooth enamel and puts more sensitive areas at risk of decay. Even worse, receding gums expose the tooth roots, which are much more sensitive to bacteria than enamel alone. The tooth roots are responsible for allowing blood flow to the face and anchor the teeth into the gums. If the roots become damaged or infected due to exposure to oral bacteria, they can easily break down the very thin wall of cementum surrounding them. Once broken down, tooth loss is far more likely, even if teeth are healthy. For this reason, the cause of your receding gums needs to be treated promptly to maintain your oral health and smile. Receding gums are a typical side effect of moderate levels of gum disease, but it’s far from the only possible cause. Gums can also begin receding when patients brush too hard, floss too hard, or brush for too long. Patients only need to brush for two minutes at a time twice a day and floss once a day; any longer is only causing enamel erosion and receding gums. Luckily, all of these causes can be easily prevented by taking the right steps. The first step should always be to discontinue any habits that you’re aware of, including tobacco use, consumption of harmful beverages, and whitening products. You’ll also want to switch to a soft-bristled toothbrush if you haven’t already, as hard-bristled brushes can be just as harmful as overbrushing. Next, schedule a visit with your dentist to address issues out of your control, such as teeth grinding. Then, you can have a customized nightguard to protect your smile and prevent future recession. If needed, your dentist can provide periodontal therapy to reduce inflammation and remove diseased tissue through scaling, root planing, and laser gum therapy. Don’t let receding gums take over your daily habits. Schedule a visit today to get treated and get your oral health back on track! Dr. Robert Long earned his DDS degree from the University of Health Science Center at San Antonio. Thanks to his General Practice Residency at the University Hospital, he had the opportunity to treat medically-compromised patients through complex restorative treatments. To learn more about his practice, contact him through his website. Comments Off on Your Dentist Says You Should Never Ignore Receding Gums!